When Zia Donatella comes to live with the Bertolizzi family, little do Alfie and his older sister Emilia know what’s in store for them. Zia Dontella is determined to show the kids how a home-cooked meal is better than even the best take-out pizza or burrito. And when Zia’s plan actually transports Alfie and Emilia to famous food cities around the world, they learn first-hand how food can not only take you places but can also bring you back home. 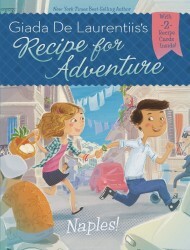 Alfie and Emilia find themselves transported to Naples, where they meet Marco, a young Italian boy on a very important mission to shop for the essential ingredients for his family’s entry in the city’s annual pizzafest contest. In their whirlwind search for the perfect items, Alfie and Emilia not only get a taste of Italy, but also find themselves refereeing a family feud between Marco’s family and his uncle’s family. Next, Alfie and Emilia are transported to Paris, where a case of mistaken identity finds them caught up in the behind the scenes drama at a traditional French cooking school. As they explore the beautiful city of light and try to figure out how to get back home, they meet an incredible cast of French characters, as well as sample some of the best pastries and real hot chocolate that Paris has to offer.